*- Specific conditions apply to our free towing service. Do you have a busy schedule with family and work? We offer FREE towing services* for both pickup and delivery for your vehicle. 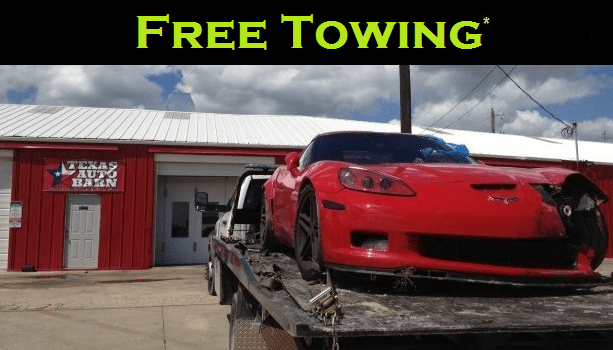 At Texas Auto Barn, we want to make things a little easier by offering up to $200 in free towing services to our customers! Auto Collision Repairs (Collision, Paintless Dent Repair, or Conventional Body Repair) must exceed $500 to apply. Call Texas Auto Barn – Auto Collision Repair first! We’ll send someone out from our trusted towing partner. Only towing fees from our supported company will be eligible for reimbursement. Have your vehicle towed to us and we will cover up to the first $200 in towing fees. This covers the hook-up fee and up to about the first six miles. If your towing bill exceeds $200, we will pay our part and then add the rest to your invoice. You can pay us and the towing company with a single invoice, with $200 off of your towing! Well, call Texas Auto Barn instead. We’ll send someone out from our trusted partner who we’ve been working with for several years—with no complaints from our customers! Their drivers are always in uniform and they’re both extremely polite and highly trained. We know that you (and your vehicle) will be safe and comfortable in their hands, which is why we choose to put our customers in touch with them. This is just another reason why we are McKinney‘s favorite auto collision repair shop!